Hot Tar, Cold Tar, & Asphalt - Among all commercial flat top roofs, these are the some of the most common and cost effective. Professional roofing has the expertise and experience to repair, cover, or tear off and re-roof quickly and economically. We also have excellent maintenance programs to prolong the lives of these types of roofs. 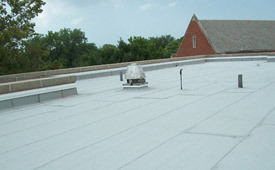 ThermoPlastic Single-Ply roofing membranes are among the fastest growing commercial roofing systems. The performance and installation advantages are many. Including heat weld seams which of course prevent leaks and perform well in high winds. This system is in demand because of its heat reflective qualities and its resistance to ultraviolet, ozone and chemical exposure. The energy savings endorsements for this type of roof ing are endless. This roof is also extremely light weight and is used incresingly in new construction and reroofs. 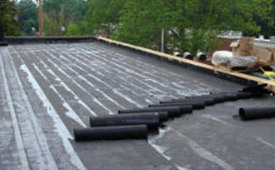 Durability and design versaltility are among some of the reasons ethylene propylene diene monomer (EPDM) is one of the most popular materials for both new and re-roof low-slope applications. This roofing material has outstanding weathering characteristics in climates world wide. Many office buildings, hospitals, schools and warehouses have elected this roofing material to suit their needs. Elegance, Beauty and Durability - These types of roofs take a great deal of experience, craftmanship and knowledge. 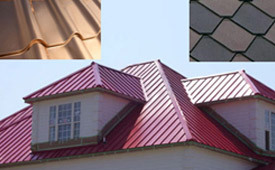 Professional Roofing Service has the expertise, personel, tools and presision to work with designers, architects and owners to properly install many varieties of metal and copper roof systems. Copper and metal roofs can last Lifetimes and bring a stunning features to any building or business. 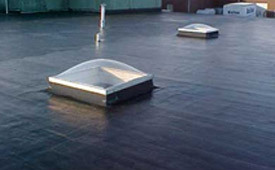 A modified bitumen roof system is a hybrid built up roof. It has the redundancy of the built-up roof, along with the added strength, flexibility and UV resistance of a modified membrane. Modified Bitumen or "modbit" membranes consist of an asphalt and polymer blend which allows the asphalt to take on characteristics of the polymer. There are several surfacing options for this system which include a factory applied mineral surface, a gravel surface laid in bitumen or a liquid applied coating that is typically reflective in nature. Typical lifespan of a modified bitumen roof is 20 years depending on weather conditions. 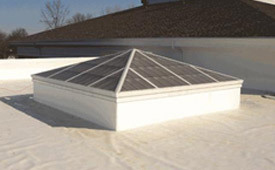 Maintenace programs can be added to this roof system to extend it's life span.